If you’re considering getting solar panels, no doubt you’ve come across LG solar panels. The higher price tag (compared to some cheap solar panels) might make you wonder about what you get for your money. Considering that solar panels are a very “stationary” technology, why should you fork out for a quality brand (such as LG)? 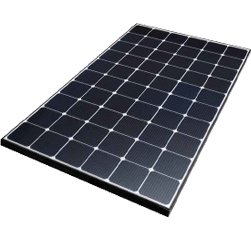 Solar panels Sydney – the market is drowned by a plethora of cheap options. 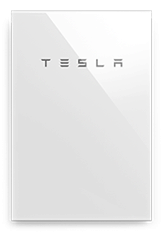 Many solar panel brands are either classified as “tier 1 solar panels” or else they might claim to be without warrant! The danger here being that you might buy a solar panel thinking you’re getting a good product and only find out down the track – by experiencing what a poor-quality solar panel can do – that you bought a lemon. LG is a company focused on quality. LG solar is no different. The premium range of LG solar panels on the market today is the best technology currently available on the market. Let’s take a look at the solar panels LG solar offer and what makes them special. The LG NeON 2 module uses what’s called a bifacial solar cell. “Bi” meaning 2 and “facial” meaning surfaces. 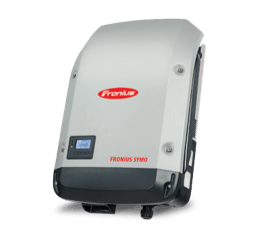 This technology allows the solar panel to absorb sunlight from both the front of the module and the back (from reflected light) giving a huge boost to efficiency. 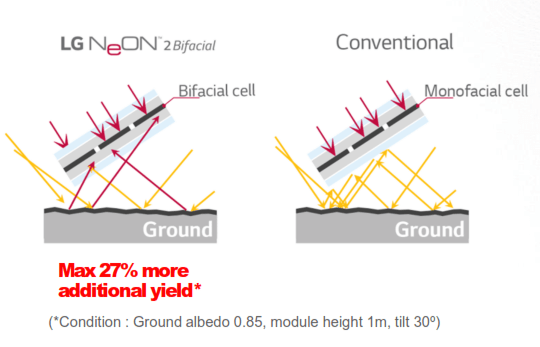 The image about shows how reflected light from the ground (or roof) increases the output from LG NeON 2 Bifacial modules. 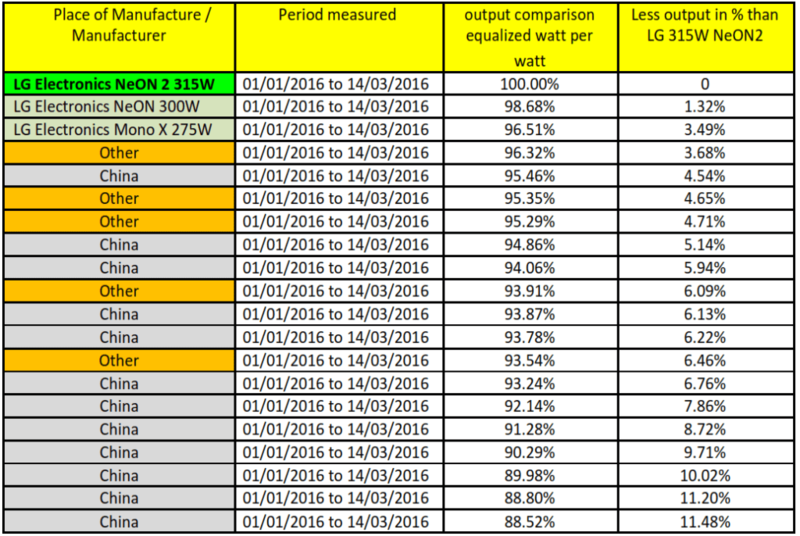 The following table shows how LG Bifacial modules can boost efficiency as much as 27%+ depending on the reflective surface and the height of the modules. Maybe that doesn’t sound like much. But on a cloudy day, bifacial LG solar panels can yeild as much as 43% more energy than a conventional panel! Even if it’s only cloudy 4 months of the year, that’s a 14.3% overall gain in produced energy! The LG NeON module takes all the merits of what LG solar panels have to offer. The NeON module precedes the NeON 2 and is therefore not the “cutting edge” technology. In comparison to a standard panel however, the LG NeON is still an extremely good choice boasting better efficiency, higher load ratings and excellent performance in cloudy or shaded conditions. The LG X2 module is an exceptional solar panel. The CELLO technology means lower loss, lower stresses and optical absorption enhancement. 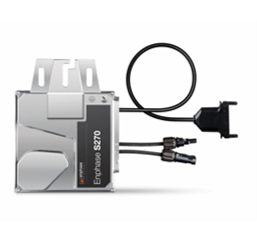 The X2 achieves double the minimum IEC requirement in temperature change testing and moisture/heat testing. It also boasts more than 10% additional front load strength and more than 200% rear load strength compared to IEC requirements. 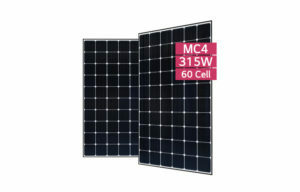 LG solar panels are built extremely well from high quality materials. Every part of the solar panel manufacturing process is automated. All processes are carefully designed to produce the highest quality module available to you. Although Trina solar panels are an excellent lower-cost option, LG solar panels have all-round superior technology behind them. The superior manufacturing standards at LG mean that you have peace of mind. LG solar panels are built to last by ensuring that they don’t just meet the International Electrotechnical Commission (IEC) requirements, but they exceed it wherever possible. Find out more about what makes LG solar panels superior here. Compared to other solar panel brands, LG offer an additional 2 year warranty on all their solar panel products. This is a guarantee from LG that your panels will last 20% longer (at a minimum) than many other solar panels. And what’s behind the warranty? Because LG is a large, experienced company, you know they will be there well into the future to address any warranty issues if they were to pop up. A dedicated presence in Australia means that you get local support direct from LG when you need it most. LG solar panels have also won a string of international awards including EUPD Research Top Brand PV Modules Europe 2015 and Best Produce 2015/2016 Plus X Award. How do LG solar panels compare? A comparison completed by LG on a building in Sydney using microinverters shows the normalised output of LG solar panels compared to a variety of other popular solar brands. As you can see, LG solar panels performed as much as 11.48% better than other standard modules in the 3 month period listed. This is a phenomonal difference in performance! As expected, the LG NeON 2 modules had the highest energy yield, followed by LG NeON and LG X2 solar panels.